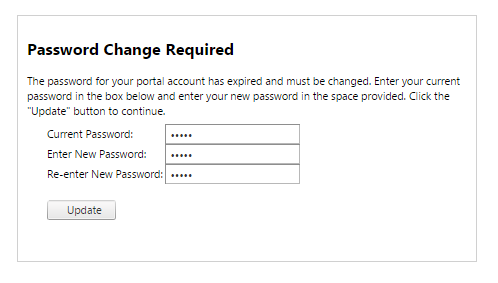 Update your password & email address in the Administration panel on the fulfillment portal. Select "Administration" from your navigation selection >>"Portal Account"
Select the hyper link "Change your account password". Another page will appear, where you will need to enter your current password, then apply your *new* password twice; for confirmation. Select "Update" to apply the changes. In the "E-mail Address" field, enter your updated email address >> "Update" to apply the changes. For forgotten passwords click "Forgot your password" in the log in Home page. The password will be reset and an email will be sent to the user.